I had no idea what to call this dinner. 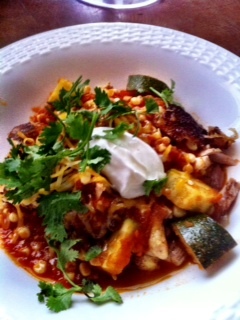 My son and I started out with the thought of making Chicken Tortilla Soup, inspired by our favorite Mexican restaurant. As you can see from the picture, this is not soup, more of a stew I think. I have never learned the heat value of the vast variety of chili peppers so I have trepidation in using them – too easy to get the ratio wrong when you are adding your own. 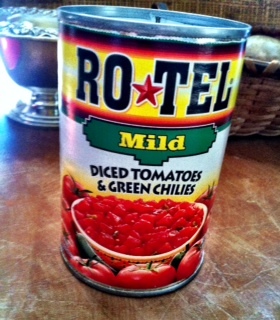 I had read a few recipes using Rotel tomato and chili blend and though I might give it a try. I was pleased with just the right amount of heat for this dish. The one ingredient we did have was the zucchini which was in the original soup – a nice touch to the classic mexican flavors. Cook the chicken thighs very well – the skin will be come extra crispy and the meat will shred easily. Oh yes, the tortillas – we cut small corn tortillas in half and then in six slices and toasted in the toaster until they dried out a bit. We didn’t use them with the dish the first time around (forgot them..) but when we reheated the leftover vegetable mixture we mixed a few in and they soften up nicely – delicious! This entry was posted in Recipes and tagged chicken, Chicken Thighs, Fresh Corn, Mexican, Rotel, Zucchini. Bookmark the permalink.